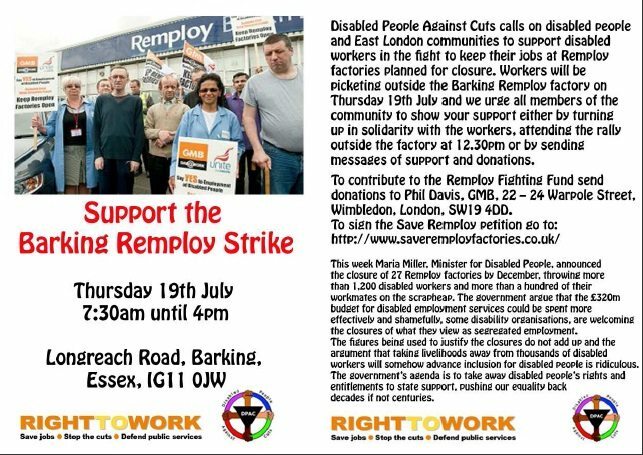 We send our heartfelt support to you for your strike days against the closure of Remploy factories. Every one of us who is disabled has a right not to have our disability used against us, and that includes the right to a decent job with a living wage. Remploy factories shouldn’t close, and wages should be higher. Workers organising themselves into unions at Remploy helped get better wages and working conditions. Closing the factories is an attempt to punish workers with disabilities for having the impudence to organise together. How dare a government of millionaires tell us our workplaces are too expensive while they give billions to bankers and corporations in subsidies, and bonuses to Remploy management with our tax money? We are determined to defend everything we’re entitled to and which we (and those who care for and about us) fought hard to get – benefits, decent wages and working conditions, high-quality services, accessible transport and more. The government is criticising “segregated employment” in order to take away what gives us some equity — our hard-won disability concessions based on recognition of the added difficulties and discrimination we face in an inaccessible society. These include Remploy and the welfare state. They give huge contracts to companies like Atos to carry out “work capability assessments” in order to justify cutting our benefits. They want us dead or begging on the street. Thousands of sick and disabled people found fit for work are having to fight to keep our benefits. Many of us, reliant on benefits, are refusing workfare – disabled people, mums (many are disabled or looking after disabled children), people of colour, people who have problems with reading and writing. We condemn prominent disabled people who claim to represent our best interests, but who are prepared to leave us with no wages at all, as they provide cover for the brutality of the government policy of Remploy factory closures — like Liz Sayce (whose report recommended ending “segregated employment”) and Mike Smith of the Equality and Human Rights Commission (who said on Channel 4 News that closing the factories is in the best interests of disabled people). Some of these disability ‘leaders’ are happy to take government money for themselves and their own organisations while helping to throw the rest of us out of a job. Scabs! 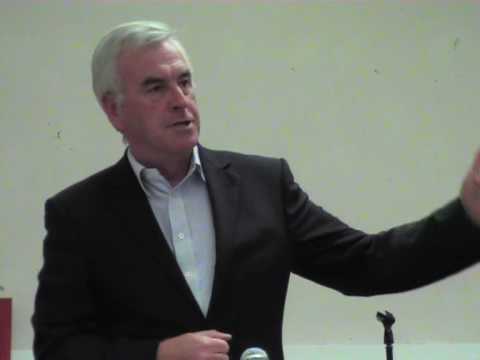 We also condemn disability charities which do the government’s dirty work, running workfare programmes that get them cheap labour, and specialised schemes for sick and disabled people forced into “work-related activity” which is contributing to early deaths. Despite the onslaught, we take courage from your strike and from any victory we are having: at least 40% of appeals against Atos are being won and there is increased support for our demands – the BMA recently voted to end the work capability assessment. All of us are workers, waged and unwaged, campaigning together to defend our rights. As part of the movement against the cuts, we are determined to support each other so we can all win. Keep Remploy! Keep our benefits! As a result of the damning Sayce Report on funding for disabled workers last year Remploy has announced the closure of 36 of its 54 factories. The first closures are imminent; and the remaining 18 will be forced to shut by the end of 2013 if they cannot reduce the subsidy for per disabled factory worker. NOW COME AND HEAR WHAT THE REMPLOY WORKERS HAVE TO SAY! 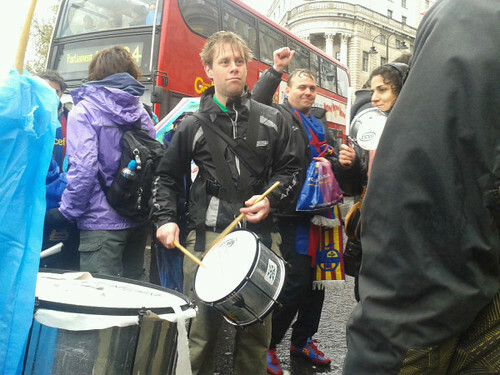 Disabled people came from different parts of the country and assembled at Leicester Square and moved off towards Trafalgar Square. It started raining intermittently. Police accompanied us and were not happy that we were on the road. They tried to get information and we heard them asking what were our plans but none of us spoke to them. 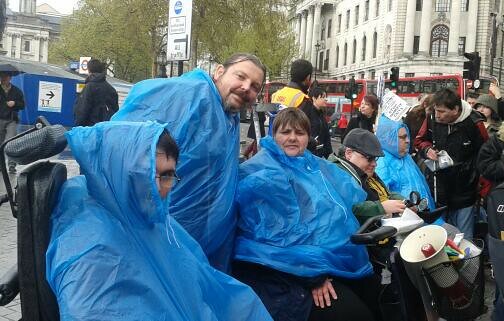 Arriving at Trafalgar Square, 2 groups of wheelchair users split up and block up two junctions. Police tried to get us off the street while activists chanted and voiced their protests. In the pouring rain the activists stayed put inspite of the police trying to move us on and the drummers kept spirits up while we chatted and handed out post cards to passer bys. Time went by very quicky and we decided to finish at 4pm and ended then. Thank you everybody for making it such a success! Rights not Charity! Disabled access via Malet street entrance. Adapted toilet on second floor. Disabled accessible lift. The announcement by Maria Miller, Tory Secretary for Work and Pensions, that she would close 54 Remploy factories in a two phase attack on disabled people must be fought and challenged by the whole of the Trade Union, Labour and Disability movement. workers. Workers who will be paying the ultimate price with their jobs for the economic crisis that they had no part in causing nor benefited from, unlike the multi millionaire bankers and the very good multi millionaire friends in the Cabinet who are doing very nicely, thank you very much out of this crisis. down the company in order to ease the way for closure of the factories. in 2007 only 6% have found alternative employment. Instead of slashing jobs and wrecking lives the government should invest and give disabled workers the power to make Remploy the workplace they want. meeting and show your support. Remploy factories are not for closure and not for sale at any price! We must show the strength of feeling that taking jobs from disabled people should not be tolerated in a civilised society. Please come – and bring your friends – and bring your families too!! committed to fighting to save the Remploy factories and our members’ jobs. may well make it worse. FURIOUS disabled workers protested yesterday against the boss whose report led to the Con-Dem Government closing their factories. 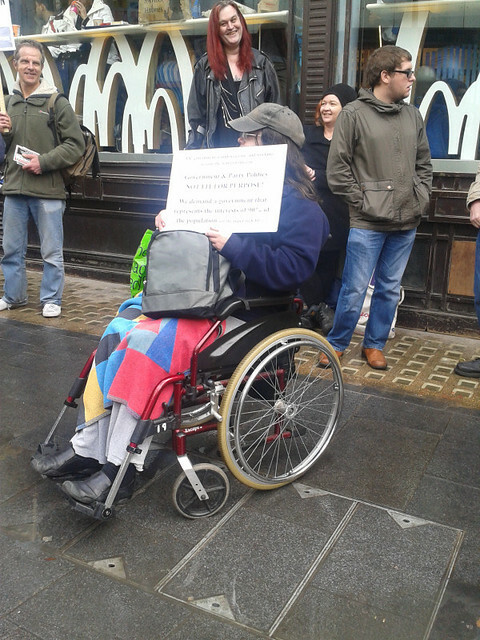 A group of workers from Remploy picketed a conference where Liz Sayce, chief executive of Disability Rights UK, was speaking. “We think it is an insult to disabled people and society in general for her to attend that meeting. “Employers won’t employ disabled people – they are three times more likely to be unemployed. The standard response of the disability movement (whatever that is these days) has been to say no to segregated employment – they’ve said that since the 70s. The government mantra which insists that ‘work is good for you’ now seems to sit in an even more unbelievable place than it did a week ago after the closing 36 of the 54 Remploy factories. What’s more a set of formal disability organisations seem to think it was a good idea for up to 2,000 disabled people to join the current regime of trying to claim benefits in one of the worst ever social and economic periods to become unemployed. So now they’re doing the government’s dirty work for them. Is unemployment preferable to segregation? This is not the 70s- its 2012. Those not in work are being pursued by a regime of Atos testing repeated assessments and loss of income, or being put on JSA and workfare placements, all are labelled scroungers and frauds. Organisations take up more and more church halls every day to provide food parcels, people are being left without any income, suicide rates amongst disabled people are increasing, unemployment is at an all time high, many disabled people have lost jobs and rates of unemployment for disabled people, like those of every other group, are increasing. The difference for disabled people is that when the employment market is good we have half of the rate of non-disabled people in employment. It is more difficult for disabled people to find employment and very little has been done to change that. So how can any disability organisation ‘back’ more disabled people being thrown into this situation-who are disability organisations working for? It’s down to the Sayce report and review. In a nutshell this said that Remploy factories cost too much for the government to run and if the government closed the factories, then it could put more money into Access to Work and support more disabled people-many were sold on this but isn’t it all a bit too simple? Access to Work have been restricting and changing criteria since 2010, making employers pay more for changes, reducing the list of items that could be claimed from AtW and have hounded those on AtW in an effort to get them off it. Will we see charges for employers reduced? The list of items that can be claimed for under AtW increased? Or a lessening of the hounding of those with learning difficulties and others by AtW? Remploy workers and their unions should be consulted on this; they should have been consulted from the first…Remploy factories should continue to be subsidized, it is the management and board structure that should be removed with control going to disabled people as workers and their unions. So why aren’t the formal disabled peoples’ organisations all calling for this and backing disabled people at Remploy? Julie Newman, acting chair of the UK Disabled People’s Council, said the idea of sheltered, segregated workplaces belonged in the last century, but disabled Remploy workers should be supported to take control of factories themselves, setting up user-led social enterprises. I cannot see how making the best part of 2,000 people redundant is going to advance the disability agenda one iota. Les Woodward wrote this in response to a previous article. The Sayce Report was launched on June 9th in relative silence. It happened in an upstairs room in a building on Holloway Road London. You would think that a report that has potentially such an impact on the lives of disabled workers employed by Remploy would have been well advertised and the workers would have had a chance to attend, ask questions, maybe? Make comments? Definitely, but you would be wrong on all counts. No shop floor workers were invited, we had to gatecrash, we had to be disruptive to make our points and we were not at all welcome by the Minister, by Liz Sayce or by senior civil servants of the DWP. This sets the context for the Sayce Report and why, it actually fails disabled people. The report is highly anonymous; it is full of quotes that are nameless. The report highlights aspirations but is very light on how those aspirations are to be achieved. The report is very opinionated a subjective in its approach, which is really not surprising as RADAR who employs Liz Sayce as its Chief Executive is a well-known opponent of Supported Employment factories such as Remploy and were also signatories to an open letter to the Guardian Newspaper in May 2007 fully supporting the then proposed closure of Remploy factories. To understand fully, the implications of the Sayce Report, it must be looked at in the context of the present economic situation in the UK as well as the present political situation in the UK. 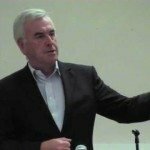 The Government has embarked on an austerity programme the like of which has not been known in living memory. An outrageous attack on the working class, public sector workers, disabled people, and just about any group in society that does not belong to the millionaire banking set that Cameron, Clegg and Osborne are so fond of. The Sayce report is weapon in the ConDem armoury, which panders to the politically correct viewpoint that now we have a whole raft of anti-discrimination legislation any disabled person should be employed wherever they like without any fear of discrimination. A very laudable viewpoint and a very laudable aspiration, but we all know that in the real world discrimination and even hate crime against disabled people happens all too frequently, just the same as Women are discriminated against in the workplace, despite decades of the Equal Pay Act being in place and Black and Ethnic Comrades are discriminated against despite decades of the Race Relations Act being in place. The report calls for either the closure or privatising of Remploy factories. The privatising of the factories could take many shapes, management buy-outs, Social Enterprises, Workers Cooperatives, etc. All of which are fraught with dangerous pitfalls for the workers employed in the factories. Remploy factories have a mix of people with all sorts of health issues and problems. The basic tenet of any factory is that the less able are helped and supported by the more able. Under private ownership the first consideration would be to cut costs, the less able would be viewed as an added cost to be stripped away to save money. In 2008, 2,500, people lost their jobs in Remploy. In 2009 the GMB surveyed those members who had left and only around 5% had actually found work, of that 5% less than 5% of that number had found a job equal to, or better than, they had in Remploy. Liz Sayce almost takes pleasure in rubbishing Remploy factories. There are several references to factories being described as ghettoes, as workers having non jobs and not being sustainable. All of us would have seen images of our troops in Iraq, and Afghanistan wearing nuclear, biological, and chemical warfare suits. These are manufactured by disabled workers in Remploy Leven, very highly skilled workers who produce garments that are designed to save the lives of those who wear them and are therefore very highly specified. Aston Martin cars are a British icon, the brake assemblies are assembled in the Birmingham factory. One of the workers is totally blind and has for years produced work that is safety critical and has to be right 100% of the time with absolutely no room for error. Non jobs? Hardly! Neither do we consider ourselves as working in ghettoes. We have lives outside of Remploy, many of us are active in our communities, some of us are active politically, and socially as well. Just as important we are economically active, paying our taxes and national insurance. We spend our money and contribute to our local economy and when we travel we contribute to other local economies. The fact that we choose to work with other disabled people is our choice. We were not forced into Remploy and by golly we will not be forced out. We are proud of our skills, proud of our products and believe it or not we are proud of our Company. A Company that is a great company, a company that could be a lot better granted, but great never the less. A Company, which has been miss-managed for years, by expensive, overpaid and massively under talented senior managers. A company that has a board of directors that are not capable of running a burger van on the high street at kicking out time on a Saturday. A Company, that governments of all persuasions have allowed to become inefficient and bureaucratic, with layers and layers of costly waste. But that is not a good enough reason to close it, but it is a very good reason to restructure it from the top down and to bring it into the 21st century, in order that new generations of young disabled people can learn all types of skills including life skills and basic skills, learn work ethic, and learn to be valued members of society who contribute positively to that society.